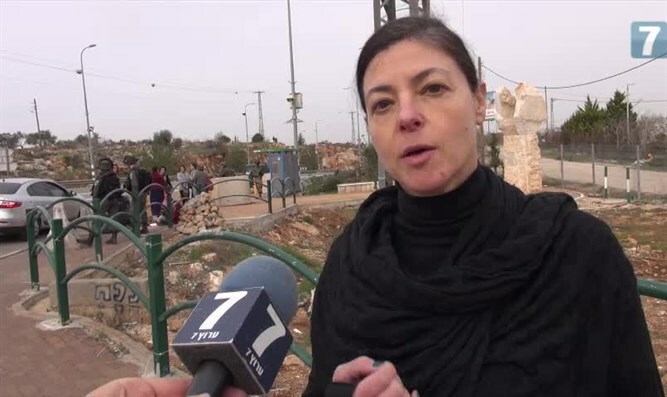 MK Merav Michaeli (Zionist Union), a member of the Knesset Foreign Affairs and Defense Committee, joined the other members of the committee for a tour of the scenes of the terrorist attacks at the Ofra and Givat Assaf Junctions Sunday. During the tour, MK Michaeli told Arutz Sheva: "It will not surprise you that my perception is that the way to deal with terrorism is to reach a political settlement with the Palestinians. Unfortunately, this government empowers the extremists among the Palestinians. The knowledge that the Hamas squad and the money it receives under the auspices of the Israeli government have been used to carry out terrorist attacks in Judea and Samaria is so frustrating and difficult to accept. It's time to work with the moderates." Right behind you is where a baby was murdered. What price should we exact for that? "The State of Israel is a state and does not exact a price. The State of Israel protects its borders and protects its citizens, and therefore the State of Israel must have a border, but right now we have no border to defend. "There is no coalition and opposition in the war on terror. A war on terror must persist if there is or is not a peace process. . But we must understand that without a peace process then we will forever be condemned to fight terrorism, and that with a peace process we will end terrorism. Israel needs a border to protect civilians. I hope we reach an agreement that will make us all live in peace and security."